Brian Hwang has brought a stack of MO t-shirts to Haruzo Hida's 60th birthday conference at UCLA this week. You can pick one up for $7 in the graduate lounge on the 6th floor in the Mathematical Sciences building. Is it possible to order an MO t-shirt online? You can get them from zazzle if you like, or you can use the high-resolution image linked from the logo page to make your own. Alternatively, if a shirt your size is left over after this week, and you're willing to figure out and tell me how to send it to you, I can mail it to you. This isn't a math-discussion site, though. It's a MathOverflow-discussion site. That banner should at least say "Buy" and not "Pick up" since (to me) it now gives the impression of free T-shirts. Is there a way to make the rather intrusive banner go away when one has read it? Could it be shown only on the main page anyway? Or, failing all that, can it not have the orange background which makes it stand out so much? to chrome/userContent.css in Firefox’s profile directory works. Now I only have to remember to remove it once it’s over. We could make that a user preference. The drawback would be missing out on important system messages so this is perhaps not a good idea. It would be doable a user preference cookie that has low expiration time, but system messages are sufficiently infrequent (and should generally have lifespan no more than a few days) that it doesn't feel worthwhile to do it. Since this particular message isn't at all important, has been up for a couple of days, and somebody complained about it, I've taken it down. In any event, I'm curious as to why this is so objectionable — at $7 apiece I doubt that Brian is making any money off of this. 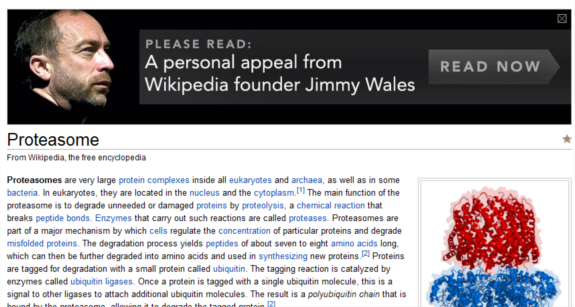 [Do people abstain from using Wikipedia on account of the banners? :)] I'm at the conference and many folks here learned about the availability of the shirts from the MO frontpage and seemed quite excited, so I think the announcement has done some good. I complain that you took the message down, Anton. Now the complaints have evened out; do what you think best. I agree that the banner was not at all objectionable. In case it was unclear, I didn’t object to the banner per se, only to the fact that I can’t get rid of it even though I’ve already read it multiple times, in combination with its distractive design.